This award winning 18 year old whisky is very popular. Let us give it a go! It is very fruity in the smell. Lots of apples but also some darker fruits like sweet plums and raisins. Light oak and vanilla influence, but most of the sweetness comes from the fruits. Lots of fruity sweetness in the taste. Some nice sherry influence alongside some fresh fruits. The finish die rather fast though, but while it last it is very pleasant and full of fruits. Cherry, berries and plums. It is almost like I am eating a plum. 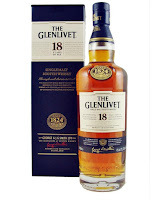 If you are into the fruity stuff and in the same time like the fresh style from The Glenlivet, you will love this one. Only minus is the low percentage… Just bumping it up to 46 % would do wonders for the finish. I will rate this 88/100 (22/23/21/22).